Recover lost or deleted photos. 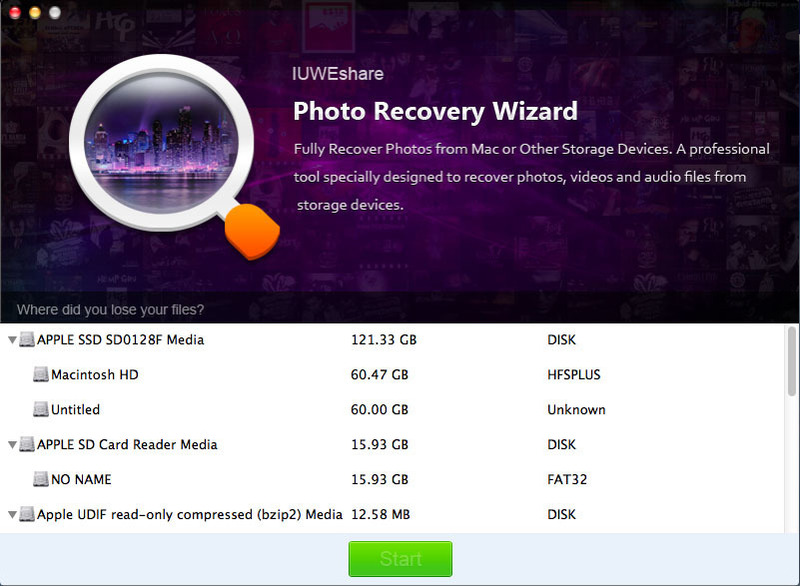 Is there a better alternative to Photo Recovery Wizard? Is Photo Recovery Wizard really the best app in Photography category? Will Photo Recovery Wizard work good on macOS 10.13.4? Photo Recovery Wizard can recover lost or deleted photos from Mac based hard drive and other detachable storage devices, like SD Memory cards, digital cameras, external hard disks, USB flash drives, mobile phone, iPod on Mac. Images formats like BMP, GIF, JPG, JPEG, PNG, PSD, TIF, TIFF, PCX, SCR, ICO, NEF, NRW, CRW, CR2, SR2, ARW, SRF, DJVU, PGM, K25, KDC, DCR, RAF, IFF, PBM, MEF, JP2, MOS, X3F, ORF, ERF, INDD, PEF, PSP, MRW, DNG, RAW, PCT, TGA can be retrieved.